Lemon and blueberry are like a match made in fruit combo heaven. To me, there is nothing more refreshing than a pop of lemon zest in a recipe. Combine that with the tartness of the blueberries and you have perfection. And what better way to enjoy it than for breakfast?! These pancakes are fluffy and delicious. The blueberry sauce is the perfect compliment and doesn’t take long to make at all. 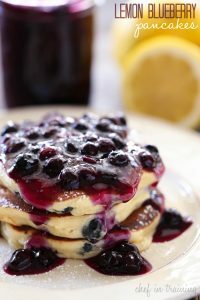 This is such a fabulous combination, I love lemon and blueberries! We're making these for breakfast tomorrow :) ! Shared on my Fb page & Pinned! I made these and they were wonderful! I could drink that syurup! I don't have any buttermilk or lemon zest on hand, so I'll have to use my regular plain 'ole boring pancake recipe tomorrow, but I am SO making that blueberry syrup to put on top!!! My husband and I have made these multiple times and they are AMAZING! Thank you for such a great recipe! I consider myself a very good pancake maker. Though I have a no-fail recipe, I'm always looking for something new. I had plenty of blueberries on hand and figured I'd give this a whirl. The batter was so runny I knew it wasn't going to cook right. I ended up trying to save the batter, but it produced gummy pancakes that my kids ate, but I could barely choke it down. The blueberry sauce was sickeningly sweet. Gross. OMG the sauce.....was AMAZING!! It was all perfect. Yummy! Could you please tell me how many pancakes this recipe makes? Thanks so much. They look amazing!